These table top displays are designed to attract the attention of moviegoers who have just seen Mel Gibson's movie, The Passion. They consist of a clear 8.5" x 11" ( 4" front to back) literature holder affixed to a 14" x 22" rigid plastic board. The table top display is self-standing on a counter or can be attached to a wall or a floor stanchion 14" x 22" poster frame. A sample brochure suitable for printing is also provided. There are four types of viewers: 1) Those that are not aquainted with the Christian message, 2) those that are knowledgeable, but are not Christian, 3) those that are Christian, but are not attending church, and 4) those that are attending church. All four types are subject to deep emotional stirrings, the film having AWAKENED a realization of what Christ did. The natural question for most viewers is WHY DID HE DO IT? Large crowds come out of the film dazed, almost in shock. Most don't know what to do with their emotions. 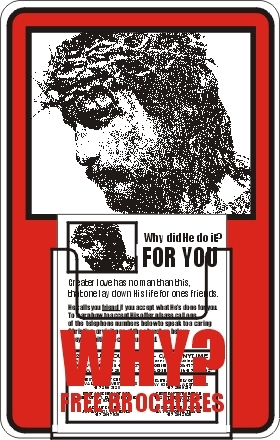 The table top display answers the immediate question of why Jesus died and offers an opportunity for all four types of viewers to get further information by reading the free brochure. The hallmark of the Passion Table Top Display Program is the immediate offer of counseling by phone. The best thing for a person in shock is to talk with a trained counselor. The counselor lets the person vent and helps the caller understand why he feels so deeply and what to do with these emotions. The counselor can explain the Gospel and point the caller to a local church. 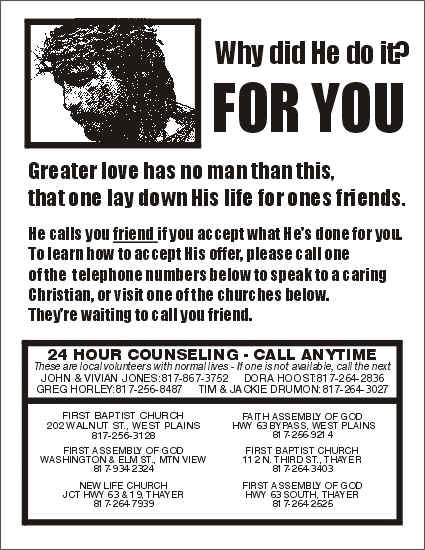 Those viewers that don't want counseling can find caring churches listed on the brochure. It is our hope that they will find a church, and be discipled. Most local churches will allow you to list their name, address and telephone numbers as long as it doesn't cost them anything. You will need at least 3 churches listed for the movie theater to take you seriously. After you have printed a sample brochure, take the brochure and the table top display to the local movie theater. Explain to the theater owner that local churches are concerned about viewers coming out of The Passion with deep emotions, not knowing what to do with their feelings. Present the display and brochures as a benefit to the community, coordinated by the local churches, providing information and counseling. This is a sample brochure. 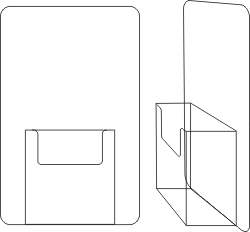 The copy-ready brochure you will receive with the table top display will be blank inside the rectangle.